I’ve been tying myself in knots this week, trying to work out how to best fulfil a brief for flowers in troughs for an event. The first half of the week I was thinking how I could de-municipalize plastic window boxes, and the second half of the week, racking my brains to find spring flowering plants would fit the colour scheme and spec. These trains of thought weren’t proving fruitful or inspiring, so my mind and fingers kept veering away from the prospect of putting ideas down on paper for the client. As part of my procrastination strategy, I decided to indulge myself with leftover flowers from various orders, and have a bit of a session with my living room mantlepiece, just for the hell of it. The online video course I’ve subscribed to with Ponderosa and Thyme insists such activities are good for the soul and I tend to agree – sometimes it’s liberating to work with flowers just because you want to see what happens. And so, armed with my favourite new concrete troughs, I cleared the candles and clutter, gathered up my leftover Cornish narcissi, and some glorious Dutch double tulips which I’d found myself unable to resist at the flower market, and a few reachy branches from the garden. My Garrya shrub never seems to sprout the grey catkins I covet, but it does have lovely leggy branches (tall bit, left) which add a bit of form at this depleted time of year. The righthand reachy bits are hazel branches with dangly catkins, and a silver leaved buddleia branch with a bendy, twisty, crispy flower spike. 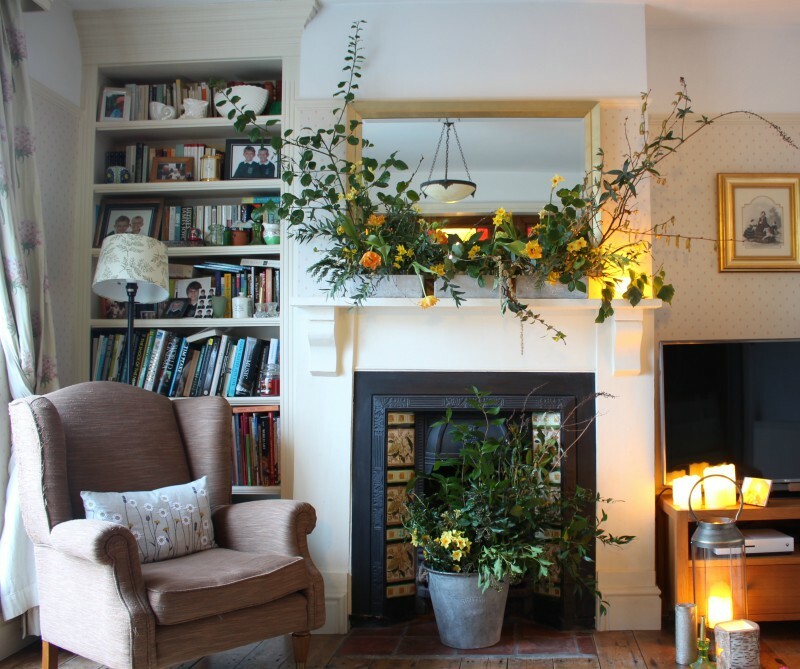 My only firm plan when I started was that I wanted some tulip droop in this mantlepiece extravaganza, as I love the way these flowers twist and turn as they grow in arrangements. Having put the exuberant thing together, I was reminded that container size is not the be all and end all of arrangements – these troughs are small, but the arrangement reaches the ceiling…. so why not go down this route for the quote in hand? Containers I love, and flowers which speak to me of gardens and not Victorian parks. I wasn’t actually thinking about my order conundrum while I was making this, but when I realised it was a workable idea for a linear arrangement that was ‘me’ I suddenly felt really excited about the prospect of making the potential order, rather than like a queasy imposter in anticipation of doing something that I didn’t ‘feel’. The quote flew from my fingers in short order after that and now it’s a matter of waiting to see if the client feels the same!